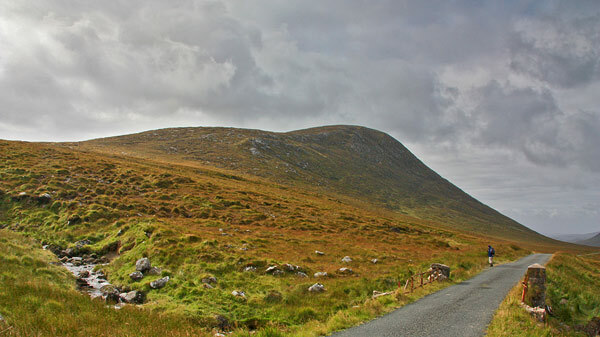 There is another hill of the same name in SW Donegal near the Glengesh Pass, but there it is anglicised Mulnanaff. Moylenanav is the 447th highest place in Ireland. Picture from group : Moylenav from the North East. Picture: Moylenav from the North East. Easy walk over rough ground for dramatic views. There's impressive views of the ridge that includes Slieve Snaght and Dooish as well as Errigal and much of the rest of Donegal such as the Bluestacks from this summit. One easy way to ascend is from the NE, starting at around B9616 1492 A on the R254. There is a small battered bridge here and various places to park. Go SW to reach the summit, savouring the widening view as you ascend. The height gain is around 330m to the top and a round trip will take perhaps 90 minutes.